TVT35 is a 35-ton fixed gooseneck which is economical and dependable, easy to load and safe to operate. 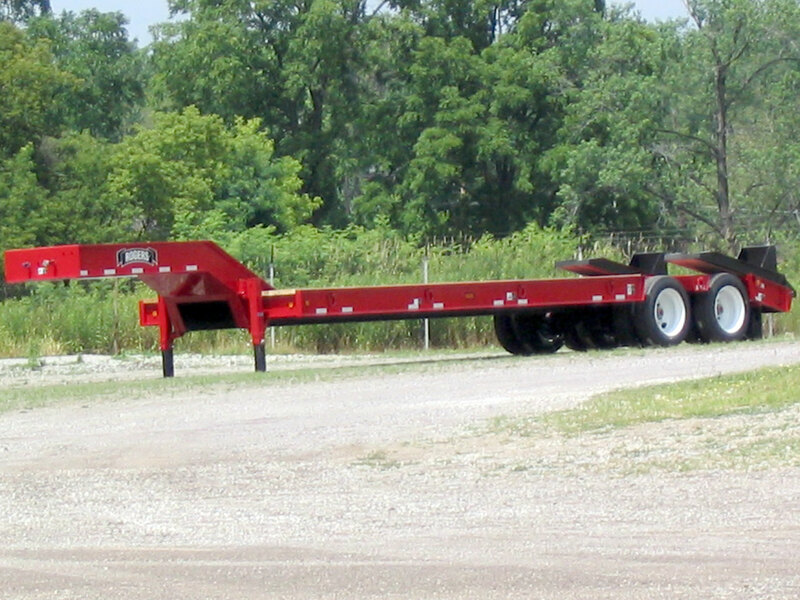 It’s the choice of companies that need a low deck, but with greater ground clearance than a "double drop" lowboy. The strong frame is made of ten-inch deep high-strength cross members pierced through the main beams. The pin type parking legs are easy to operate and have a static capacity of 40,000 lbs. The multi-leaf four-spring suspension provides a smooth, stable ride, and ABS spring brakes give the best stopping control. NOTE: ABS does NOT slow down a trailer faster; rather, ABS keeps the trailer straight when it stops, avoiding jack-knives. The 14° beavertail has dual spring-assisted "E–Z Flip" 6'-0" ramps that are quick to laterally adjust for different widths.